Your home is the place you relax and fill up your well. Ideally. You can start by creating a peaceful corner. Probably there are also many things that you need to take care of when you are home. If you, like many, have a busy weekday with jobs, children and leisure activities, your home may also be a busy place where you are struggling to find the peace of mind. It can help if you choose an area in the home that you give a special peaceful mood of “holiness” and balance. A place where you can check in to really feel yourself , where you connect to your heart, get grounded in your body, in what is truly YOU. If you think of your home, as it is now, is there a place where you feel particularly comfortable? Maybe in the bathroom. Or in a corner of the kitchen. Or maybe on the balcony or the terrace, here in the summer. 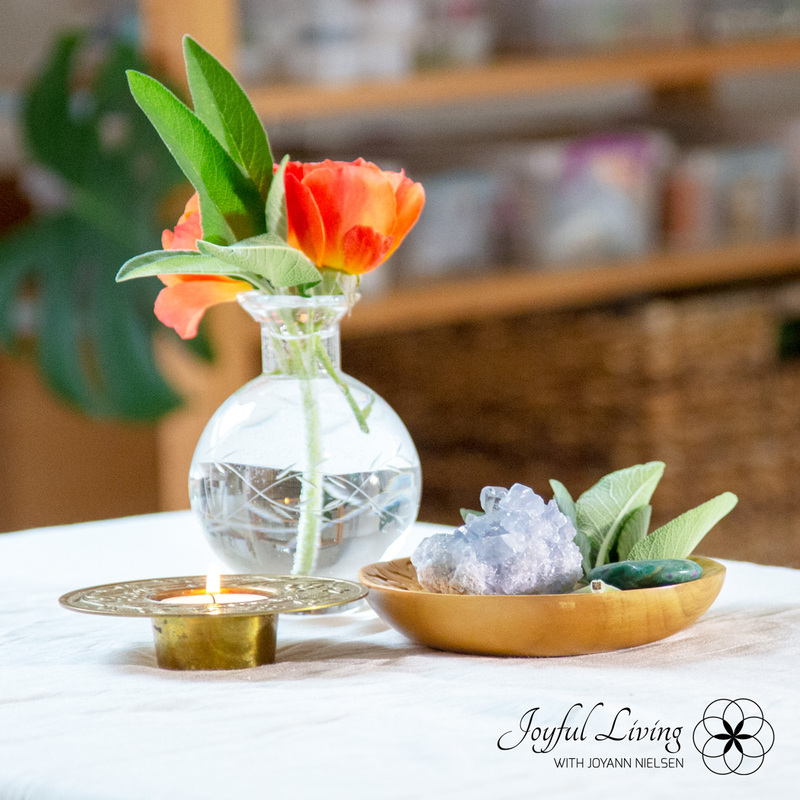 The feeling you get in this place is the mood that you can concentrate and reinforce by deliberately creating your very own peaceful corner, with the help of a few things that enhances the feeling of your sanctuary. 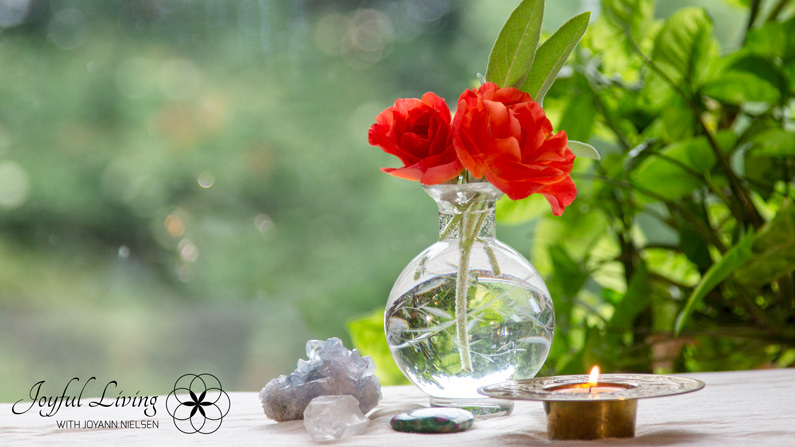 I have always used incense, crystals, candles and flowers to create my holy places. My “place of rest” in the middle of a busy everyday life. I have used the same corner for my daily yoga and meditation – but you do not need to practice yoga or anything else like that to enjoy having a “holy place”. You can use whatever you want, as long as it gives you that peaceful feeling, or makes you feel joy, ease or remind you of something that gives you a sense of being “at home” in yourself. Perhaps it’s a special thing like a gift from a loved one, a piece of jewelry, a picture or a figure that symbolizes peace, spirituality, inner contact. It is really good if it is a place where there are no other things. Maybe just a corner in the living room or in the bedroom. Choose a few things that speak to your sense of sanctuary and peace, and find a small table, a shelf or a seat on an existing piece of furniture, where you can make a nice little arrangement. Think about what it is, your peaceful place will give you. Is it calm, self-esteem, love, clarity? Do you often need to check in with yourself, or do you need guidance or just energy? Set an intention for your peaceful place. It can be simply as: When I check in, I am filled with peace, clarity and love. Some days you may have the time and the urge to check in at your place several times to charge the batteries. It will be ideal to contact the peaceful atmosphere morning and evening , so that you open your day with a loving and calm energy, and close it in the same way. The days you are too busy to remember, you can still check in on your “holy place”, all you have to do is think about the place. Then the energy, the mood, will enrich you. What you do when you arrange such a peaceful corner and fill it with a loving intention is actually called Space Clearing. Your holy corner will spread good energy to the rest of your home, and it will totally invisibly affect all who live there. When we’re in a place that is filled with Sacred Space, we feel better. We find it easier to breathe, think, dream, and to have faith in ourselves.